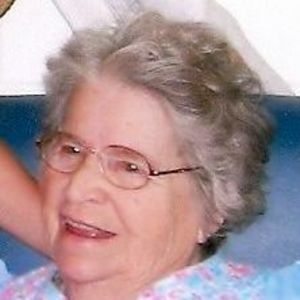 ENNIS - Mary Elizabeth Price, 97, of Ennis, died Tuesday, July 24, 2012 at 8:00PM at Belle Meade Nursing Home. Mrs. Price was born February 21, 1915 in Muhlenberg County. She was a homemaker and member of Allens Chapel Methodist Church. She was preceded in death by her mother, Murtle Tuck Newman; father Estil Newman; husband Thurman Price on August 6, 1981; four sisters; and three brothers. Survivors include her children, Mary Joann (Charles) Martin of Hatfield, IN and Larry (Evvie) Price of Ennis; grandchildren Charles Joseph (Melissa) Martin, Paul Robin (Shannon) Martin, Amanda Price (Jeremy) Davis, and Vickie Price (Danny) Travis; ten great-grandchildren; and sister, Dorthy Moore of Greenville. Funeral services will be Friday, July 27, 2012 at 2:00PM at Tucker Beechmont Funeral Home, with Travis Martin officiating. Burial in Allens Chapel Cemetery. Visitation will be Thursday after 5:00PM at the funeral home. Expressions of sympathy may take the form of contributions to Allens Chapel Cemetery Fund, c/o Larry Price, 3535 St. Rt. 2270 E, Beechmont, KY 42323. Online condolences may be made at www.tuckerfuneralhomes.com. Mary was a lady who was so very easy to love, admire, respect, and appreciate. We always left her presence with a happier heart. Memories of her bring smiles for which we are grateful. Please accept our sincere sympathy . So sorry to hear about Mary. Please accept our sympathy. Just today (Saturday) we learned that Mary died. Please accept our condolences and know we are thinking of you. What a wonderful woman and family. Aunt Mary made lifetime memories for many of us nephews and nieces. I will hold these precious memories in my heart and mind and share them with my children and grandchildren in her honor. Please accept the condolences of Don and Brenda to the entrie family. So sorry to hear about Mary. She lived a long life and had many friends. Our thoughts and prayers are with you all. If we can be of help please let us know. s passing. she lived a long life . she is at rest now.